Well, I think that's got to be my longest title yet. The very first eyeliner I had ever tried was my cousin's. 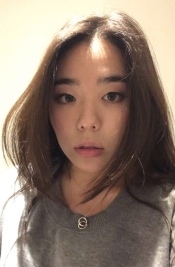 We were going to a fancy shmancy dinner and I wanted to try makeup for the first time. But when I tried lining my eyes, it was so difficult. It was a pencil one, but omg - it felt like I was trying to line my eye with a piece of rock. The colour just would not show on me, and I must've stabbed that thing onto my eye a hundred times, trying to get even the tiniest bit of colour. So from that day on, I've had a huge appreciation and love (and awe) for super creamy eyeliners. Seriously. 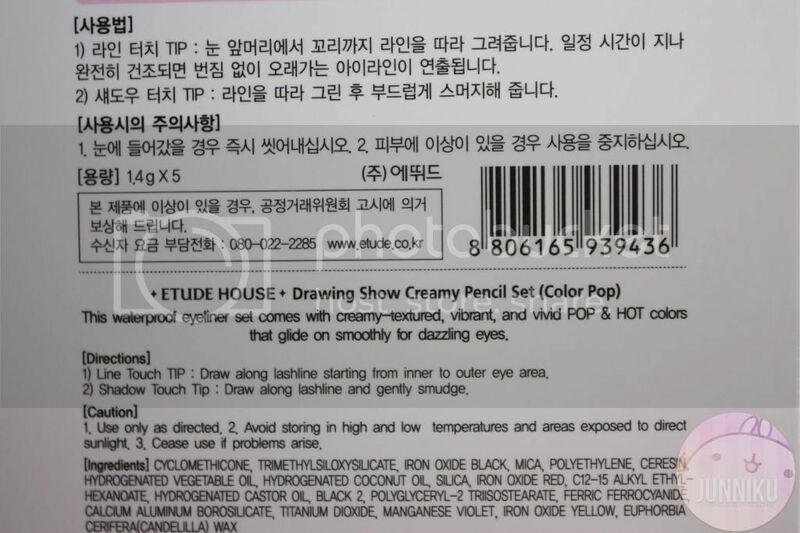 Today I'll be reviewing a set of Etude House eyeliners - they're the "Color pop drawing show creamy pencils". Ever since I've tried the Holika Holika gel liner pencils, I've been obsessed with these pencil/gel eyeliners. I've never tried Etude House liners, so a kind thank you goes out to ibuybeauti! As always, let's take a quick look at "ibuybeauti" store. They're an online store that sells many different Korean cosmetics. Their website is very easy to surf through, as there are subcategories made for easy browsing. The store carries well known brands, such as Etude House, Tonymoly, Innisfree, Lioele, Holika Holika and more! The thing that most stands out to me is that they carry other brands as well. All korean cosmetics stores sell the brands mentioned above, but oftentimes I can't different brands. It's definitely harder to find CNP, Dr. Jart, Espoir, Hera and (my favourite) Laneige. High five to IBB for carrying them, though! You may have heard of ibuybeauti's store - but did you know they also have a well known Youtube channel? If you watch "Get It Beauty" on YT with English subtitles, chances are that you've watched it on ibuybeauti! They subtitle and upload such episodes for everyone, Korean and non-Korean, to watch! Click "Read more" for more pics + swatches! 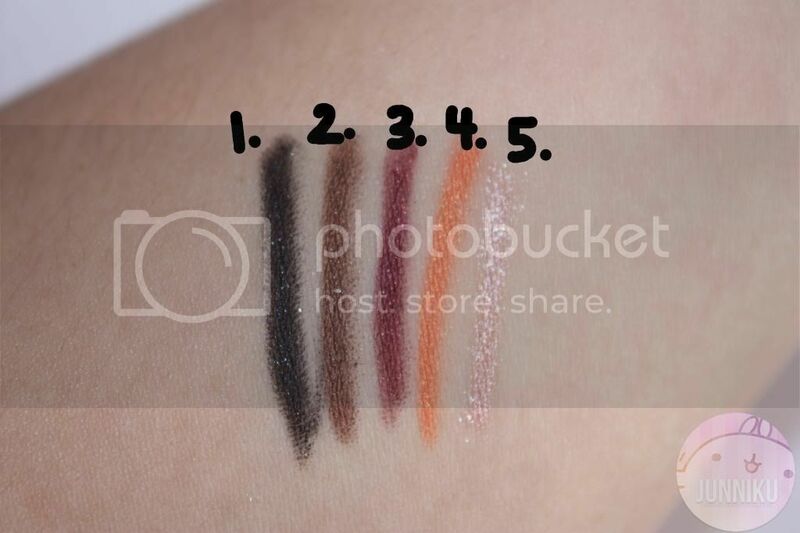 This is a set that contains 5 different coloured eyeliners. 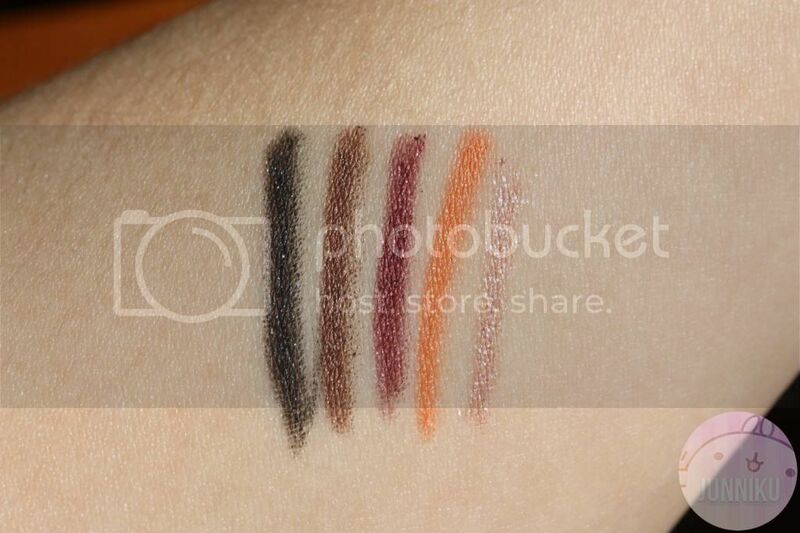 All of the eyeliners have some shimmer or sheen to them. Black & brown have the least noticeable shimmer, burgundy & orange have a more noticeable sheen/shimmer, and pink has the most. If you look closely (or not), you'll see that the skin around my arm is pretty red. I tried rubbing off the eyeliner really, really hard and it just wouldn't come off! A bit of the brown and orange did, but that's because of my hulk strength. 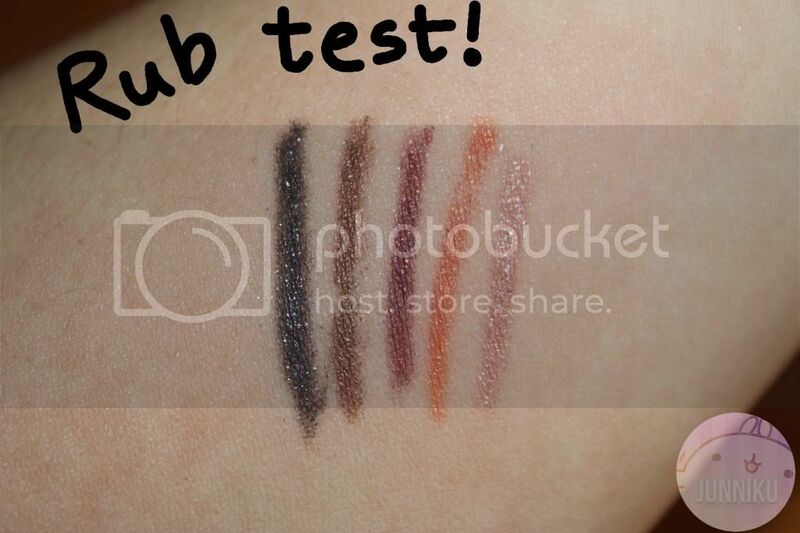 This picture shows the swatches after I had running water over it (as well as rubbing it). 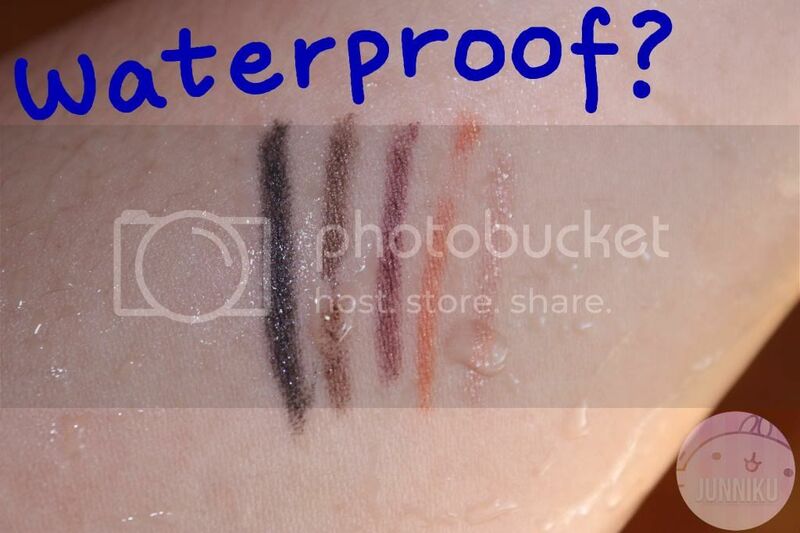 The water didn't make the eyeliners budge at all. However, the eyeliners did erase a little bit where I had rubbed them off. In reality, water or rubbing with water won't affect it at all. Because really - in reality, you won't have your eyes exposed to non-stop flow of directed water, or that much force on them. Even though I'm obsessed with super creamy pencil-y gel liners, I've only stuck with Holika Holika's. I wasn't "adventurous" or anything, and I held the thought that no other brand could offer the absolute 'amazing' that Holika Holika does with their liners. Hooooookay. I was so wrong (I'm wrong in so many of my makeup beliefs, arghh!) - Etude House color pop liners prove to be a serious rival against my previous HG from Holika Holika. - HH has much more sparkle/sheen. - EH has a sheen and a slight shimmer, but you can't really tell that there are actual sparkles in the liner. - HH is slightly more creamy at application, and must take at least 10 seconds to "set" before it iron-grips your eye. - EH liners sets faster than HH. - EH (1 liner) is slightly more expensive than HH (1 liner). 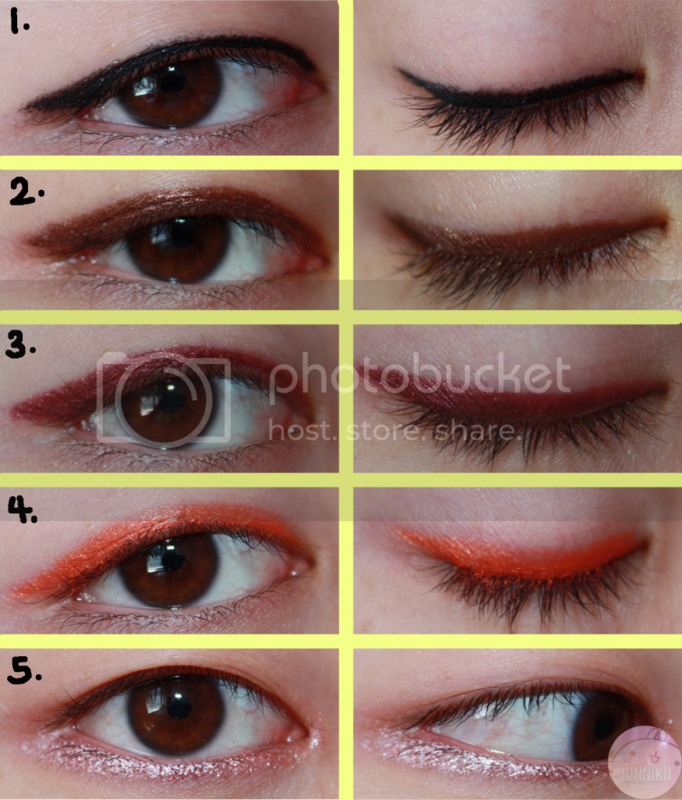 The only thing "meh" about the Etude House liners is that one of the colours are super, duper creamy (Orange). They're creamy to the point that when applied, the pigment will actually cling to my eyelashes, no matter how careful I am. I guess one way is to super sharpen the liner, and apply it really precisely...? As for colour - out of this entire set, I'd wear black and pink the most. I did really, really like brown when swatched - but when it's on my eyes, I want a slightly darker shade than what it offers. I wouldn't normally wear the burgundy or orange colours, unless I'm creating a specific look! Is this 5-set worth it? When something comes in a set, I immediately assume that there is some kind of discount. If I get it, it'll be cheaper than buying the same amount separately. Right? 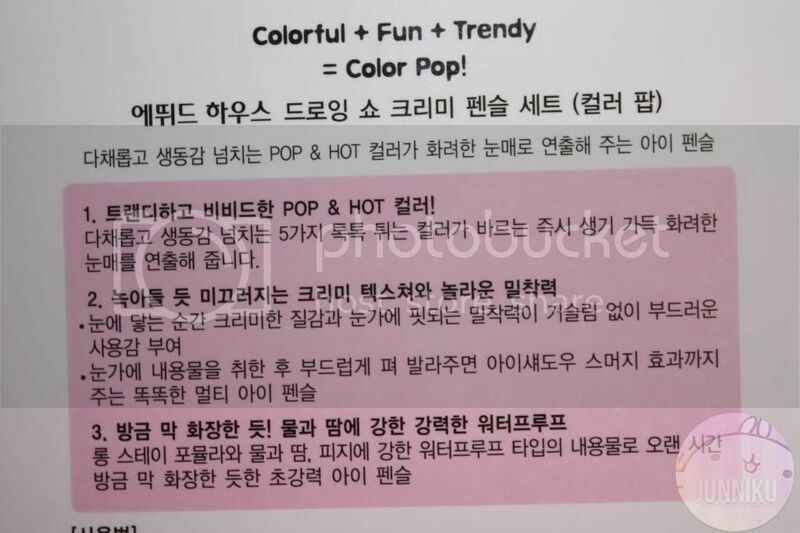 Ibuybeauti does not currently sell the Etude House color pop liners separately. I found the price through Etudehouse's ebay store, where each sells for $10.36 USD. So is buying this 5-set ($31.99 at Ibuybeauti) worth it? Compared to buying 5 liners at Etudehouse ($51.80), yes. Though it (the $32 price) can be improved, the price is fair. I've seen this set priced at $38+ in some stores, and some stores do sell it for less. Personally, I'd keep buying this eyeliner - in different colours. I wouldn't repurchase the set, because I feel like I won't use most of the colours on an everyday, "gotta get out of the house NOW, i'm late!!" day. 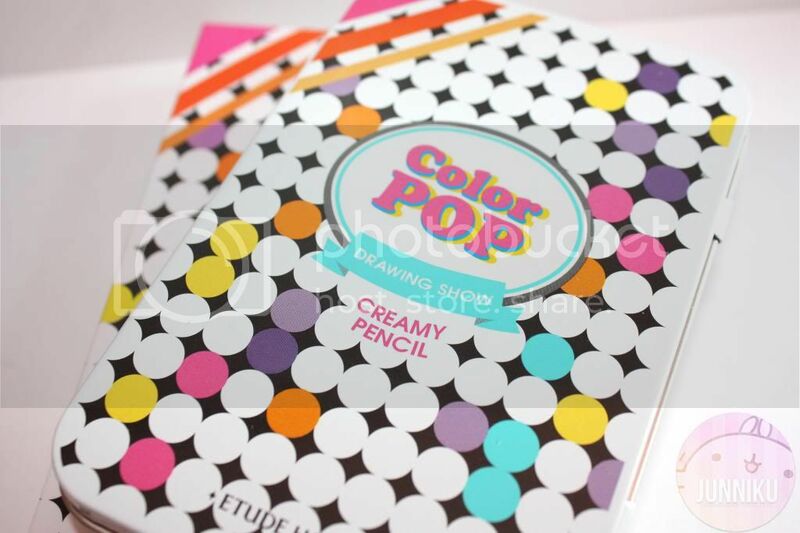 Have you tried the Etude House color pop liners? What'd you think about them? BTW, do you often wear color eyeliner (burgundy, purple, green, red, etc)??? Disclaimer: This product was sent for review purposes. As always, this review is 100% honest. My opinion cannot be bought. Ohh I like the burgundy one ^-^ Thanks for the review! Why everything in Etude House is so darn cute :3 Love the product!!! Have to try them! weww I was on the verge on buying this one but I bought clio's creamy eyeliner set instead... if only I saw your blogpost first! But I liked them too anyway! haha nice review! Great review dear. I like the colors. Love the shades great job in the review. The burgundy one is my favorite! Great review! I love creamy eyeliners as well, I really love that sparkly pink color! Great highlight!! I really like Urban Decay 24/7 liners, but they're too expensive if I can't get them on sale. So I really like NYX's Slide On Liners. They're pretty much identical to UD's 24/7 liners, but at a fraction of the price! they looks really smooth tho. i wouldnt get the whole set but i definitely like that jealous pink one! I recently purchased these and love how creamy and smooth they are! Their staying power is excellent as well - I am definitely in love with their gel liners. My current everyday liner is their Sweet Recipe chocolate smudge liner. 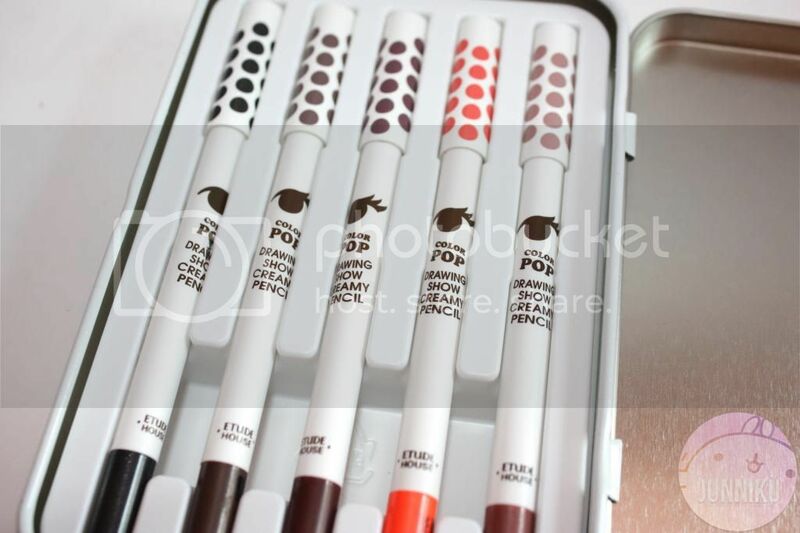 Considering that I almost order a eye-pencil kit from sigma, I would totally try to get one of these. Beautiful colors and the incredible quality of the products of Etude House. 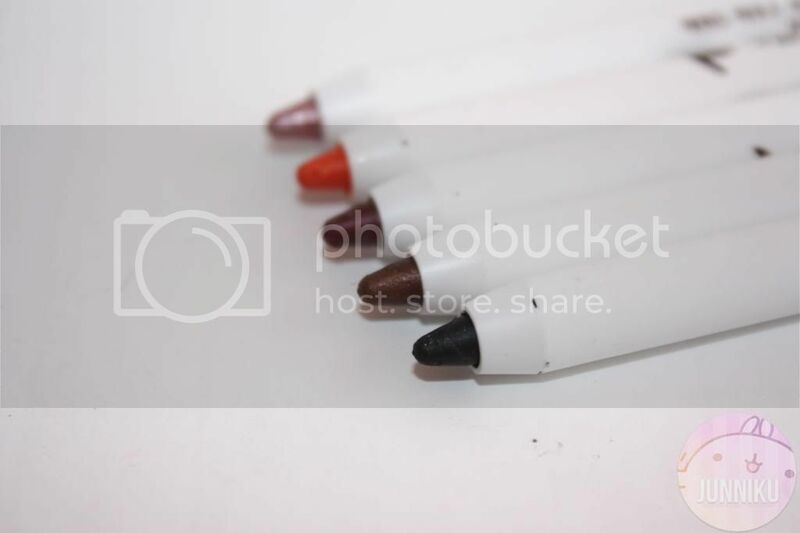 I would love to try those eyeliners, I've been looking for some nice colorful ones that work.